US equities took a bit of a breather this week from their torrid rally off the Christmas Eve lows. While anyone long equities would like to see the market trade consistently higher, nothing moves in a straight line. At this point, the sideways trading this week can still be considered nothing more than a pause as the market looks to catch its breath. Next week, though, we should get a lot more clarity on which way this market wants to move as the FOMC will announce its latest views on monetary policy Wednesday, followed by a Jerome Powell Press conference. Just as important, the pace of earnings reports for Q4 will even pick up more steam as nearly a quarter of the S&P 500 (122 companies) will report earnings. Looking at where some of the major US averages closed out the week, one of these pictures doesn’t look like the others. 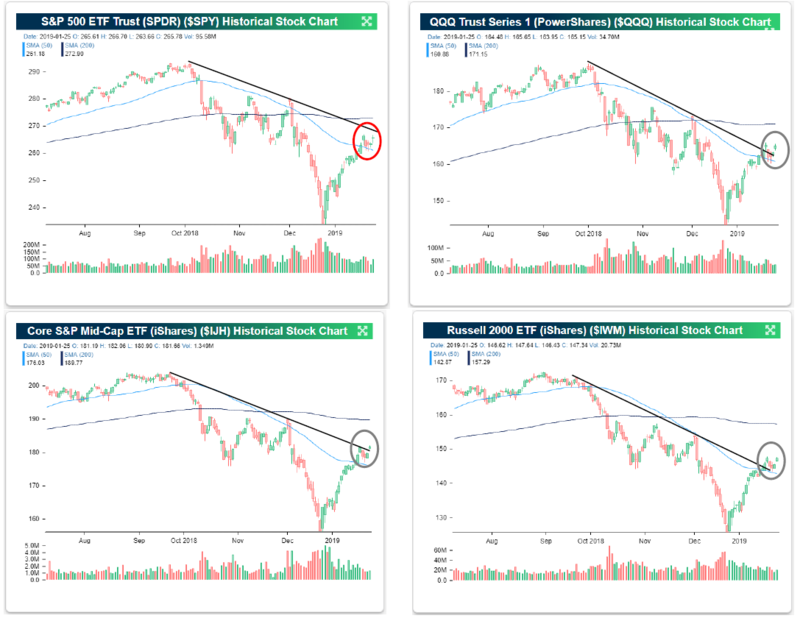 As shown in the four charts below, in this week’s trading, the Nasdaq 100, the S&P 400 Mid Cap Index, and the Russell 2000 all appear to have broken their downtrends from the October highs. The lone holdout at this point is the S&P 500, which finished the week just shy. Breadth for the S&P 500 has been very strong lately (page 30), so now all we need is price to confirm it. Something tells us, though, that next week we’ll have a good idea either way.